When Madrid-based Baragaño Architects were engaged to build a second home for English clients—a landscaper and his family that had fallen in love with northwest Spain's remote Asturias region—they decided to take a more industrialized approach to construction. 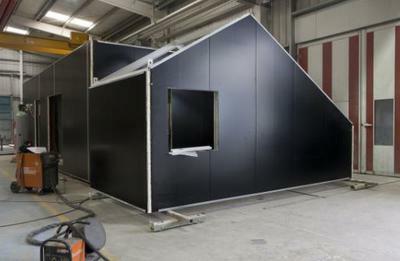 The result was a contemporary prefab retreat, actively developed together with the clients, with only a $148,500 budget. 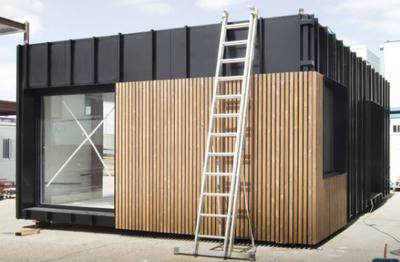 The prefabricated modules—which were manufactured in a factory in Madrid—took four months to construct. They were then shipped 600 miles across the Cantabrian mountain range to the site of an old stone granary complex. 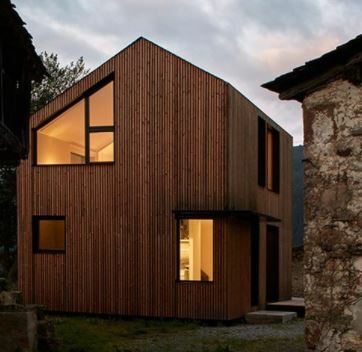 This Affordable Prefab in Spain Only Took 5 Hours to Assemble. Made of galvanized steel sheets, the modules were clad with thin vertical wood slats, and assembled on-site, with the black slate roof put in place by a local craftsman. The resulting 1,076-square-foot residence pays its respects to the surrounding historic structures—fitting perfectly into its remote, rural locale. The two-level home is centered around a suspended white metal staircase. An open-plan kitchen and living room occupy the ground floor. A wooden deck surrounds three sides of the house, and a large glass door and windows open out to the porch. The upper level contains the two bedrooms, separated by a light polycarbonate wall that allows light to pass through and illuminate the second floor. 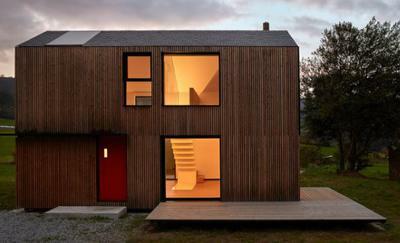 The home is energy-efficient and constructed from sustainable materials. Eventually, should the owners' desire, the home can be dismantled and easily transported to a new location.